South Australia was one of Australia’s youngest colonies, and the only colony for which the British made meticulous settlement plans – including a master infrastructure plan – before arrival. When South Australia’s first Governor, Sir John Hindmarsh, was appointed in 1836, global advancements in agriculture, transport and technology were helping the colony to thrive on the international stage. In South Australia’s infancy, railways underpinned its economy; train networks opened up the vast outback for settlers, and they connected miners, farmers and pastoralists to vital trade routes. South Australia traces its locomotive history back to 1854: a horse­drawn tramway graced Australia’s first iron rails, which ran along a 10­kilometre stretch between the coastal towns of Goolwa and Port Elliot. Two years later in 1856, the first state­-owned and built steam train began operation between Adelaide and Port Adelaide, marking the first of its kind in the whole of Australia. In the early years of the colony’s rail network, lines were often short and disconnected from important stops, but by the 1880s, the South Australian rail system was centralised and sophisticated, with nearly all lines linked to Adelaide. The colony’s railway expansion showed no signs of slowing. In 1879, the Great Northern Railway was built to service Port Augusta to Quorn; by 1883, it had reached the outback township of Marree, and by 1891, it reached Oodnadatta, even further to the north. This network was the first manifestation of the famous Ghan, the new version of which was completed in 2004 to run between Adelaide and Darwin. However, today’s Ghan runs on a line some 200 kilometres to the west of the line used in the 19th century. While South Australia’s infrastructure flourished in the colony’s youth, it would take the best part of the 20th century for Australia to standardise gauges across different states and allow a cohesive national rail network to emerge. A branch of the transcontinental line was added between Tarcoola, South Australia, and Alice Springs in 1980, and then again to connect Adelaide in 1982. Only as recently as June 1995 were Melbourne and Adelaide linked by a standard gauge line for the first time. 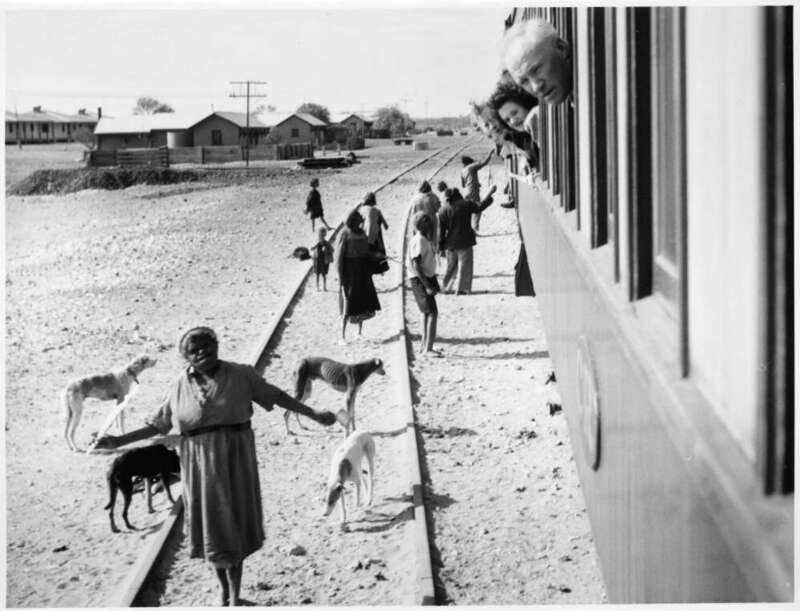 Image: Passengers on the Trans-Australia train c 1940, by Frank Leyden, courtesy of National Library of Australia PIC 7359 17.